The 24th Azerbaijan International Telecommunications, Innovations and High Technologies Exhibition and Conference, Bakutel 2018, opened at Baku Expo Centre today, marking the beginning of the High Technologies Week. The visit by the President of the Republic of Azerbaijan, Ilham Aliyev, testifies both to the care and attention of the country's leadership to this area, and to the authority of Bakutel. Speaking at the opening ceremony, the Minister of Transport, Communications and High Technologies of the Republic of Azerbaijan, Ramin Gulu-zade, emphasized that Bakutel has become a traditional meeting place for industry professionals and the largest ICT event in the region. Business leaders, professionals on the Bakutel platform solve global issues, discuss promising projects and make important decisions. At the same time, the exhibition demonstrates the latest achievements and innovations in the field of ICT, determining the possibilities of international cooperation in this field. Congratulating the participants and guests on the opening of the exhibition, the Minister wished the participants a successful work. Kirill Oparin, head of the zonal branch of the International Telecommunication Union (ITU) for the CIS, read a welcome letter to the participants of the exhibition of the ITU Secretary-General, Mr Houlin Zhao. The message, in particular, notes the growing role of Azerbaijan in numerous projects implemented by ITU, and the influence of our country on the long-term development of the industry on an international scale. The director of Caspian Event Organisers, Mr Edward Strachan, informed about the positive factor of the exhibition, which this year brought together 230 companies from 20 countries of the world at one site, demonstrating a 25% increase in the occupied area. Mr Strachan also thanked the Ministry of Transport, Communications and High Technologies of the Republic of Azerbaijan, the International Telecommunication Union (ITU), the Regional Commonwealth in the Field of Communications (RCC), and sponsors and partners of the event for their support. The exhibition demonstrates solutions for digitalization, Big Data, M2M, Internet of Things, banking technologies, 4-5G mobile technologies, services in the field of fiber-optic and cloud technologies, the latest ways to prevent cyber-crime, public services, e-health, artificial intelligence, mobile devices and accessories, smart city, control systems for unmanned aerial vehicles and drones and much more. This year, the honored guests of Bakutel are ministers and high-ranking guests from Russia, Afghanistan, Belarus, Bulgaria, Iran, Kazakhstan, Kyrgyzstan, Latvia, Turkmenistan, Turkey, Uzbekistan and other countries. The exhibition Bakutel 2018 showcases 10 national stands of such countries as Italy, Iran, the United Arab Emirates, the Republic of Belarus, the USA, Slovenia, Turkey, France, Croatia, Poland. Leading Azerbaijani state-owned ICT structures are harmoniously represented at a single national stand, organized by the Ministry of Transport, Communications and High Technologies of Azerbaijan. A new direction of the exhibition is the involvement of small and medium-sized businesses, private technology developers to solve problems in various fields from oil to entertainment, in order to promote the development of their business. This direction is being developed with the support of the Agency for the Support of Small and Medium Business of the Republic of Azerbaijan. This year the exhibition features a record number of startups - over 50 from various innovation centers. An impressive part of the development is based on the application of virtual and augmented reality technologies, the development of websites and mobile applications. In addition to the annual meetings and conferences, the exhibition announces the holding of Bakutel Tech Talks, a new energetic discussion platform created by the organizers at the exhibition. For two days, December 5 and 6, Bakutel Tech Talks will become the focus of the audience with a stream of useful information and unusual content, demonstrating the experience of major international IT companies, new products in the industry and know-how. Thus, Bakutel Tech Talks will address the most pressing issues of the industry and become a trendy platform for discussions with opinion leaders. 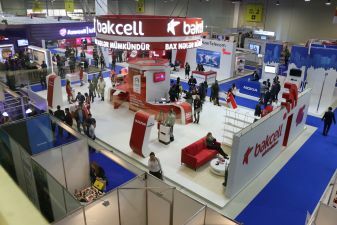 The organizers plan to hold Bakutel Tech Talks annually as part of the exhibition. This year, the third day of the exhibition coincides with the celebration of the professional day of workers in the field of communications and information technology in Azerbaijan. Taking this opportunity, the organisers congratulate communication and information technology workers on this wonderful holiday and wish them every success.